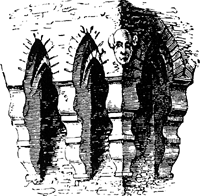 Openings formed by setting the parapets out on corbels so as to project beyond the face of the wall. Some parapets set out on corbels have a similar appearance, even if there are no openings. An overhanging defensive structure at the top of a medieval fortification, with floor openings through which boiling water or oil, missiles, etc., could be dropped on attackers. Below the parapet is a set of machicolations through which missiles could be dropped on besiegers. The lower, straight-axis front gate, accessed across a drawbridge and opening into the bailey, was crowned with heavy overhanging machicolations. One of de Chirico's paintings, Mystery and Melancholy of a Street, features a typical metaphysical setting where a girl runs up a street (not a rampart but a ramp) and the building behind her shows spires and machicolations. On the north side, it rose from the sheer cliffs (falaises) of a rocky spur; ont the west it was linked to a smaller keep and on the south, to a 35m high cylindrical tower surmounted by machicolations, added in the thirteen century. In particular he was responsible for encouraging the use of brick and much of this work has survived, though at Tattershall the machicolations are surely more aptly described as impressive than "formidable.